There are two types of tickets that you'll encounter when using an airline, namely the paper ticket and the electronic ticket (also known as ticket-less travel). Paper tickets are quickly being painted with dinosaur strokes — they somehow seem less current. Before weighing in on such perceptions, it is important to look at the advantages and disadvantages of these two types of tickets. Paper tickets are so named because the flight coupons (the pieces of paper that contain the exact flight information and are labeled as flight coupons) are in paper form. With an electronic ticket, this information is held within the airline's reservation system and is indicated as electronic tickets when you check in. The passenger traveling on an electronic ticket is given a copy of the itinerary, and the contract of carriage. These documents are not a ticket but serve as an indication that you have an electronic one. With an electronic ticket, you do not have the physical ticket in hand. Knowing that paper and electronic tickets are different isn't really enough though; it is important to know what the positives and negatives are as well. Paper tickets are particularly useful if your flight is canceled because of a mechanical or another airline-related problem as opposed to a weather issue. Certainly, if the cancellation is weather-related, you are stuck. However, if it isn't and you have a paper ticket, you may have a world of options that you possibly haven't considered. If you have a paper ticket on a major airline and are flying out of an airport where another major airline also flies to your destination, having a paper ticket can serve to your advantage. If your flight is canceled, you can ask an agent at another airline whether they will accept your ticket (more difficult to do if there is more than one terminal that airlines fly from to your destination). Often the other airline will, and you are now ahead of those on electronic tickets. You see, with an electronic ticket, because you do not have a physical ticket, you are more at the mercy of the airline you are booked on. And in the case of a non-weather related cancellation, you will be put on the next available flight on that same airline, even if it is hours later. Paper tickets can also be advantageous in situations that don't involve cancellations. Let's say that you are checking the schedules to your destination and discover a more convenient time on another airline. With a paper ticket, you may just be able to switch airlines, particularly if it is a domestic ticket (and not on a charter airline). If it is an international destination, don't bother, as the rules of international tickets vary a great deal, whereas domestic ones are often incredibly similar. As an example, an unspoken rule at a major airline was to accept tickets from other airlines if the passengers showed up at check-in. It was a large airport with numerous terminals, and a number of airlines served the exact same route. So agents were instructed to scoop the passenger, which meant accepting the passenger's ticket from another airline and taking (scooping) some of the other airline's profit. This does not occur on a consistent level at every airport, but it does happen and could serve to your benefit if you have a paper ticket. Ticket-less travel means that your ticket is never lost or stolen. If you lose the documents that the airline sent you, they can produce another copy at the airport. For many people, the fact that you cannot lose the ticket is the saving grace of an electronic ticket. It is really quite remarkable when you realize that there are a lot of people who have accidentally left their paper ticket at home, or the office. 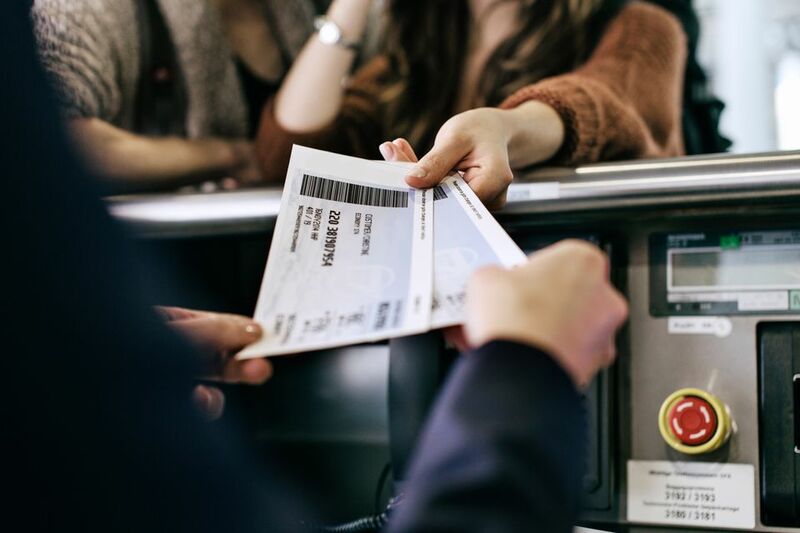 Unlike electronic tickets, if you leave your paper ticket at home you will either have to pay a fee to have the ticket replaced (if it is a discounted ticket), buy an entirely new ticket (as is often the case with full fare tickets), or not be able to travel at all. Electronic tickets eliminate this possible stress, and for many travelers, particularly frequent travelers, not having to worry about a forgotten ticket is a big selling point. On a number of charter airlines, and even on some larger airlines, you are only allowed to have electronic tickets or you have to pay a fee for a paper ticket. It costs an airline more money to produce paper tickets, and some airlines are taking to the practice of passing that cost on to the passenger. And then there are airlines that do not issue paper tickets at all. Airlines that issue electronic tickets do tend to be charter airlines or smaller airlines. International travel often involves using paper tickets instead of electronic ones because in some countries they want to see the proof of return travel and will accept nothing less than a paper ticket. Others will allow electronic tickets, and airlines will capitalize on this when possible because it is much cheaper to issue an electronic ticket. When you use more than one airline you tend to be given paper tickets, ​basically, because airlines do not all use the same reservations systems, and it is, therefore, necessary to have the proof that you have a ticket on each airline. Around the world, tickets tend to be issued as paper tickets as well because not only are you usually traveling on more than one airline but because you don't always have to set exact dates for travel. There are other differences between the two tickets, but they are more important for airline audits than anything else. And for those who are now deeply concerned that their electronic tickets have left them with few choices in the case of non-weather related cancellations, rest assured. When there is no space on other airlines it doesn't matter if you have that paper ticket instead. And if the situation turns dire for the offending airline, they will call up other airlines and try to grab seats when available on those flights regardless of whether your ticket is electronic or paper, and will hand you a form to be accepted on another airline.